Sydney Shop Girl: The Return To Work. His and Hers Birkenstocks At Yoga. The Return To Work. His and Hers Birkenstocks At Yoga. My body has a great memory. My first day back at work was not as painful as I had feared. The alarm clock went off and I instantly snapped into my work day routine. I was on autopilot on my run (nice that dawn actually features a bit of sunrise these days as opposed to the darkness of a few weeks ago) and found the drive in early peak hour(s) reassuring. I got to the office, made myself that eye opening cup of Moccona and it was almost as if I'd never been away at all. Just like for school children back for the first day of term (and possibly for every day of term, you poor parents), I had a clean and pressed outfit laid out last night. Unlike school - I even included a piece of jewelry, my RPE Lady Melbourne necklace. At least now I don't have to worry about regulation coloured hair ties, how to make my hair bouff up like Fergie (the Duchess, see below), which colour of Impulse spray to suffocate myself with or even which boys may or may not be walking down the street on the way to school at the same time as I. Life is definitely so much simpler these days. The skirt was even better than freshly ironed and dry cleaned because it was BRAND NEW. I 'found' it on Sunday in my secondary wardrobe. A Veronika Maine bargain from the DJs winter sale this year. 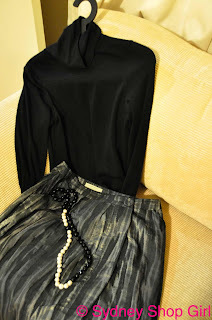 Very forgiving tulip skirt for the post holiday body I might add. 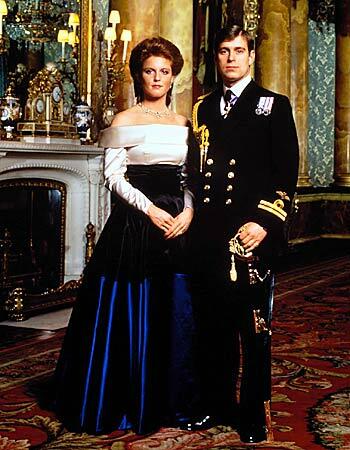 Sarah Ferguson's hair was to 1986 what Jennifer Aniston's is to 1991 until the present. I was so with the programme, I even made it to yoga tonight. However, before the body and mind can be challenged in the way of Mr Iyengar, it needs energy. Preferably chocolate based. 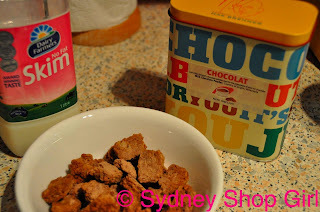 Chocolate Weetbix with Max Brenner chocolate powder, a healthier crunchy chocolate milkshake than say... Coco Pops? The chocolate cereal was a good move. Tonight we pretzeled ourselves like there was no tomorrow (which there may not be if I fail to get out of bed tomorrow on account of being too loosened up in my major muscle groups). Then there was my misadventure whilst doing a shoulder stand. I blame MorrocanOil for causing my hair to be silky enough to move my head whilst I was trying to balance the rest of my body on top of it. On the up side, I survived Mr SSG and I are truly a Balmain yoga power couple. We arrived and departed class shod in his and hers Birkenstocks for the very first time. It was whilst we where in Kyoto that Mr SSG chose to see the light and appreciate Birkis for all the arch support that they are. Enough about me. I've just checked the news and we still don't have a PM. Centrebet is telling me that odds favour a LNP minority government but there has not been any real news out of Canberra for the last week so who really knows? We should all have celebratory barbecue lunches, a public holiday even, when the news finally is announced, one way or another. How can Australia be without a PM this close to Grand Final weekend? It's unAustralian. There has been progress for the miners in trapped underground in Chile though. Today was the first time they established verbal contact with their loved ones. The rescue team were finally able to set up a phone line that could reach the 33 trapped men. Each was allowed 1 minute to speak to their loved ones. There is also a single supply shoot that enables goods to be transported to the group. It's apparently the diameter of a soup can. Theoretically anything that size can be shuttled down the tube. Cans of beer or coke, Mint Slice or Tim Tams, Arnotts BBQ shapes (minus the cardboard box) come to mind. There must be healthy things too? Fruit (bananas may need extra padding to prevent bruising), yoghurt, cans of soup. Sadly everything but 4 months of sunshine, moonlight, fresh air, touches and glances from loved ones. Well, regular readers may have noticed something absent from today's post. Japan! I found the kimmidoll brand in Market City on the weekend. 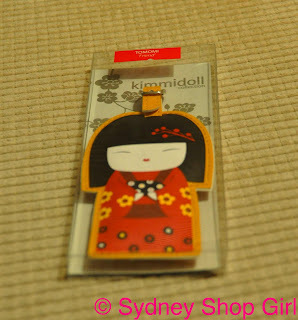 I bought this luggage tag as a gift for a friend overseas. There are pens, bag hooks, magnets and even a baby range. All very reasonably priced. They are an Australian brand too. Gotta go. I am in the work routine zone. I'm going to lay out another outfit so that tomorrow runs as smoothly as today. Take care, have a good one and don't worry, there is plenty more Japan on the horizon.